What do you do if you have an Unlimited Licence Agreement (ULA) and you’ve now decided you don’t need it? Perhaps you have decided to move away from Oracle altogether, business is not so good, your business is being acquired by another company, or perhaps you are moving to the Cloud. Previously business was doing well, IT requirements were growing, and flexibility was important rather than a strict list of licences needed. Over the first 18 months of the 3-year agreement, there was plenty of deployment required for most of the products listed on the ULA. However, now there has been a downturn, IT budgets are being squeezed and the company is demanding cost savings. A ULA gives the end user the right to an unlimited deployment of a number of specific products over a set time period, although in reality some products can be capped and others unlimited. An example might be that the end user is given unlimited deployment rights for Database and several options with a cap on Advanced Security and Real Application Clusters. There are a couple of key points to note here. Firstly, you are given the right to deploy the products outlined on the ULA during its period. At the end of the ULA you must declare what you have deployed. Assuming Oracle agrees with your deployment metrics (and they can challenge you on this so be prepared to manage the usage from the start) the licences will be transferred to you as the owner. Support is fixed at the start of the agreement, based on the cost of the ULA and is not calculated at the end of the period, based on what you deploy. This should be a good price, especially if you deploy higher numbers than you expect. However, the catch is, that when a ULA is agreed all existing licences are terminated and rolled into the new ULA, but the support cost is added to the support cost of the new ULA. So, for all products on the ULA where you had previous support agreements the support will be consolidated into a single contract (CSI). Sounds fine at the time but in the future, it makes it very difficult to break the single CSI if products are not needed or used. The Oracle ULA was cost effective initially, but now that consolidation and reduction is more important the annual support budget seems to be a particularly high. Perhaps there is nothing that can be done, Oracle would be willing to sell an early exit with more fees and once again no reduction in support costs. So, let’s look ahead to the end of the ULA, a declaration is needed on the third anniversary in order to certify the number of licences that are in use. As a sensible customer, you have made sure that as much Oracle is deployed as possible, utilising all the products on the ULA list so that there are plenty of licences to be declared. However, once consolidations are executed, there is an excess of licences. You are paying support for licences not being used and sitting in a pool, although you got a good deal and significant value originally, now the powers that be are looking for cost savings and reduction of annual support fees, things don’t look so good. 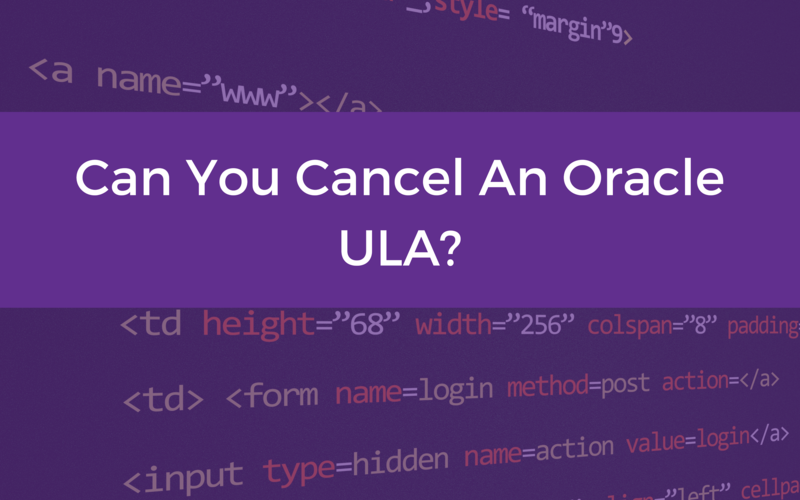 So, is there an answer, is it possible to cancel a ULA? It is possible to reduce support, but it will require a lot of planning and effort. If you try to reduce the numbers of licences support will be recalculated after you agree to terminate the excess licences, this is based on the likely discount that would have been applied and the reduced discounts applicable now. Oracle support will want to protect their revenue and you may find that the recalculated cost is very similar to the existing spend. A possible strategy is to look at what you could replace the excess licences with. There is always the possibility of moving to Oracle Cloud. So perhaps you could try reducing the support figure by replacing with Cloud services. Every situation is different, your relationship with Oracle and the time of the year can all factor into what is possible. If you are thinking of taking up a ULA or renewing an existing one with Oracle, think carefully about the future and what will be the impact. We can help you decide the value and the alternative options. Or if you think you may have some issues about reducing support, get in touch for a confidential chat. We are happy to sign an NDA and you can be assured of fully independent advice. Email info@madora.co.uk for help.